I'm wildly guessing here - is this anything to do with Japan (the country, not the New Romantic band)? Ister - No! Thailand. 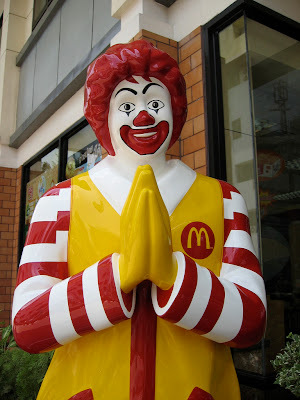 Was outraged to see Ronald McDonald anyway let alone posing in the traditional greeting. Cafe Del Nightmare and I know someone we both used to work with who went to Thailand and went mad and came back bowing at everyone whilst screeching "Sawadeeekaaaa" which means hello (politely) in Thai. Dreadful - and we screech it in moments of dire stress when we are working to make each other laugh! Mother. There Is No Other!